When launching a start-up, it's obviously smart to get as much outside advice as possible, but who are you supposed to ask? Kevin? His start-up ended with him living on your couch (though to be fair, his whole business plan involved living on couches). Offering a slew of real experts for your start-up queries, Gurustorms. 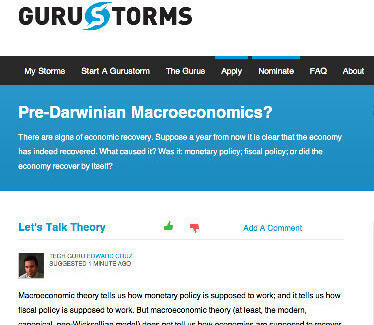 Guru's a next-level crowd-sourcing website allowing users to create a reasonably affordable 30-day business dialogue with a pantheon of successful tech-industry & social-media stars who typically either aren't involved in consulting, or charge so much for their time, you'll no longer be able to afford movies to go with your candy. How it works: first, the support staff helps you refine your basic question, then once it's officially posed brainstorming starts on what amounts to a virtual whiteboard, where folks like the managing editor of IDG (publishes over 300 tech magazines), the luminary behind DEMO (the nation's largest start-up trade show), and the PR-maven who brought Porter Novelli to Austin can present ideas, critique each other's advice, and answer your follow-ups Facebook-wall style, sans awkward party pics and whimsical musings on the Albertsons produce department. The asynchronous conversation allows the otherwise too-busy advisers to craft responses at their leisure, but to prod them 30% of your reward money does go to the first 10 to respond, while the remaining 70% is split 40/20/10 amongst the experts whose advice you found most valuable, or if you're the sort of person who really shouldn't be starting a business, the most good-looking. For those with more basic questions, Guru also hosts Bountystorms, a stupid-cheap ($5-25) companion site that allows anyone to respond to queries like "What should I call my kid's soccer team? ", "I'm a martial arts master, what should I change my name to? ", and of course, "How do you get rid of an ambitious couch surfer?"